A new museum just opened on the East Coast Road in Chennai and no, it is not full of stuffy artefacts. In fact, you and your family are likely to go berserk taking selfies with the interactive 3D art on display here – it is so much fun!! The art form is technically known as Tompe-l’oeil in French, and means to ‘deceive the eye.’ But let’s just call it 3D trick art – the kind that has two dimensions but tricks you into believing there is a third. The talented powerhouse behind this amazing effort is artist AP Shreethar. “In this museum every piece of art is complete only when the viewer enters the frame. 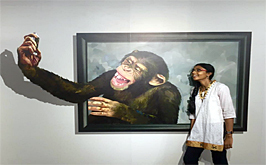 It is interactive art,” Shreethar told New Indian Express. All 24 art pieces in this museum have been painted on the wall. But viewers have to stand on the markings on the floor in front of them in order to be a part of the paintings.